ThinAir® Hand Dryer NEW ENHANCED STANDARD FEATURES Adjustable Speed And Sound Control Variable Heat Settings Multi-Voltage Options 110-120V OR 208-277V Externally Visible Service LED. The ThinAir gives you ultimate control by the inclusion of a variable motor and heater control, which allows you to change both the decibel level and wattage of the ThinAir. ThinAir operates from just 375w with a 15 second dry time and the whole unit is just 102mm in depth. 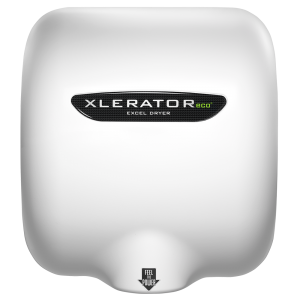 The XLERATOR is the original, patented, high speed, energy efficient hand dryer. Facilities around the world use XLERATOR to save time, money and the environment while creating a cleaner, more hygienic washroom. High Speed. Ambient Heat. 500 Watts. XLERATOReco uses Ambient Heat technology to dry hands fast while using only 500 watts of energy, making it the most energy efficient and environmentally friendly hand dryer on the planet.